For patients who have lost all their teeth, dentures can give them their lives back. Dr. Rosenfeld and his team in Solana Beach can create beautiful dentures that allow their patients to eat, chew, and speak normally. Our dentures are perfectly crafted to restore what you’ve lost and to help your overall oral health. We offer traditional dentures. We also offer implant-supported dentures. Implant-supported dentures use dental implants to better secure your dentures. First, Dr. Rosenfeld will have the dental implants placed. Dental implants are small titanium rods that are embedded within the bone and function like tooth roots. These dental implants fuse directly with the bone in your jaw. Instead of placing crowns on top of the dental implants like in traditional dental implant procedures, the dental implants will be used to support the denture and keep it in place. Implant-supported dentures fit securely in your mouth and stay fixed in their position while you are eating or speaking. You’ll never have to worry about your teeth slipping. Implant-supported dentures are still removable. Implant-supported dentures restore the same aesthetic and function the patient enjoyed prior to tooth loss. Implant-supported dentures are custom-made to meet each patient’s unique needs. Implant-supported dentures don’t require any messy denture adhesives. Implant-supported dentures provide added jawbone support that can help prevent jaw deterioration and keep your face youthful longer. 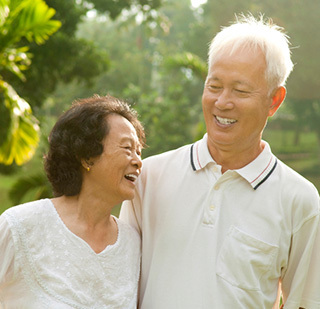 With implant-supported dentures, you can get your function and smile back. To find out whether implant dentures are right for you, please contact Dr. Rosenfeld at his Solana Beach office. You can make an appointment, or ask us questions by phone. Don’t let your tooth loss stop you from enjoying your better quality of life. Contact Dr. Rosenfeld at his Solana Beach office today.